Canby started the season with six straight emphatic wins, but in the final preseason game come up short against top team Barlow Bruins. Heading into the regular season opener against St. Mary's Academy on Tuesday, Oct. 2, the Cougars were looking to rebound against their familiar foe. The Blues had other ideas. 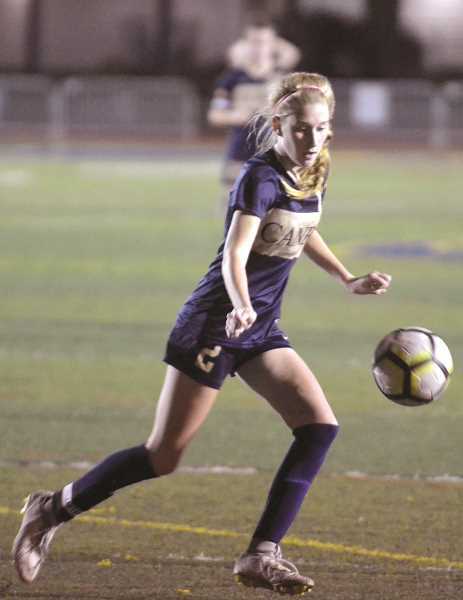 Despite goals from freshman Joeylynn Baguio and senior striker Claire Wright, Canby lost its second consecutive game 3-2, and fell to 6-2 overall. Taking to the road against the Lakeridge Pacers on Thursday, Oct. 4, the team was able to get the 1-0 win thanks to yet another Wright goal. The win improved Canby's record to 7-2 overall, and 1-1 in the Three Rivers League (TRL). Canby is tied for third in league with Tigard (8-1) behind West Linn (8-0-1), and St. Mary's (6-2-1). "We were looking for a win to bounce back, but we went out with the same game plan as every other day: play our game, execute on the little things, and work hard," Canby head coach Maria VanAcker said. Despite its standing in league, Canby is still the top scorer in the TRL, and second in state at the 6A level behind the top ranked Jesuit program. The team takes to the road for its next three contests, facing off against Tualatin, Lake Oswego, and Oregon City through the middle of October. So far this season, Canby has only dropped one road game, the aforementioned preseason game to Barlow. It will be a difficult stint away from home, according to VanAcker. "Playing on the road is hard," VanAcker said. "Playing at home is such an advantage for the girls, especially at Cougar Stadium. The fans are wonderful, the community support is tremendous and the girls love to play for their school under the lights. We're looking forward to being back at home for senior night vs Tigard." The contest against Tigard takes place on Thursday, Oct. 18 at home at 7 p.m.
With such a strong showing for the Cougars against Lakeridge, VanAcker praised junior goalkeeper Halle Adair's leadership on the defensive front. Canby shutout the Pacers after 80 minutes of play. The success and competition against the top teams in the league is part of the team's legacy building. "The girls are building their legacy one day at a time and it's so fun to watch and help them grow," VanAcker said. "They have established themselves as leaders in the classroom and in the community and hard workers on the field. They're creating quite the following of fans which is really exciting."